This is a capsule review of the iPhone app, [RedLaser](http://www.redlaser.com/). It’s a barcode-scanning application which looks up scanned products on amazon and google. In short; start the app, point your phone at the barcode, get online price comparisons. The app is extremely simple to use, and cheap, too. It can save you money in a purchase or two. 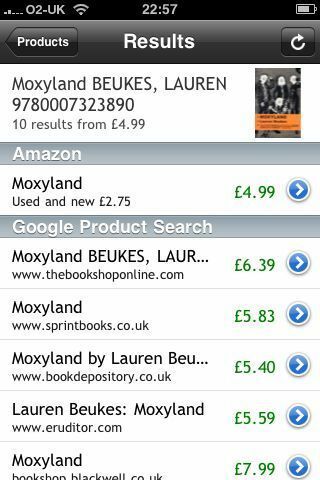 I used it at Borders the other day, scanned a book, and found a copy six quid cheaper somewhere else online. Since the app costs less than two quid, it’s a great little moneysaver. 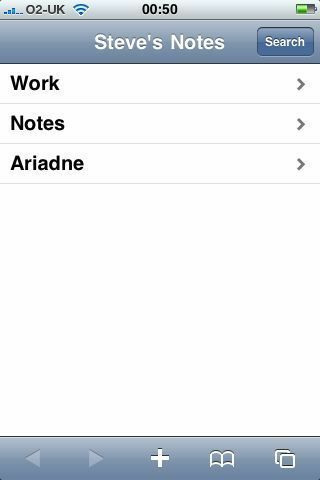 It also acts as a nice ‘outboard memory,’ storing a list which can form a wishlist. Scan in books you want to remember, and it’ll keep the list and let you email it off. Because it uses amazon amd google product search, it doesn’t work well with things that are very cheap, or own-brand products. I wondered if I could use it as a shopping list (scan stuff as it runs out) but, well, no-one sells paxo stuffing on the Internet, so no dice. What it seems to excel at is products that make good presents; books, DVDs, xbox games, and board games all worked well. I think I will be using it for my own christmas wishlist, and for keeping track of presents for friends and family. PS: a little tip. I had a couple of books fail to scan properly, until I noticed that the books had _two_ adjascent barcodes. Cover up the smaller one with your thumb and it’ll work perfectly. Awful. I can’t even wrote the list of my mistakes without making the same type of mistakes over and over. Anyway, I think if this kind of correction could be built into a smartphone editor, it would lead to much faster typing. You would be able to slap in text much faster, not worrying so much about what you really typed, and have the editor figure out from a corpus of English text what you probably meant. Good lord. I have just discovered that Google’s ‘Google Mobile’ application on the iPhone has voice search. Go to the search page and bring the phone to your ear. The accelerometer tells the app to start listening. Then just speak your search, and away it goes. I’ve done a half-dozen searches and it has been spot on every time. The future really is with us, my friends. Just to prove it to myself, I held the device up to my mouth and asked it for information on ‘transparent aluminium.’ It worked. I am Scotty, and the idea of accessing the databanks with a mouse and keyboard are starting to seem a little quaint. machine fast. Can’t go wrong. >As Japan’s dwindling ranks of farmers grow old, scientists are developing new ways to lighten their physical load and keep them productive. 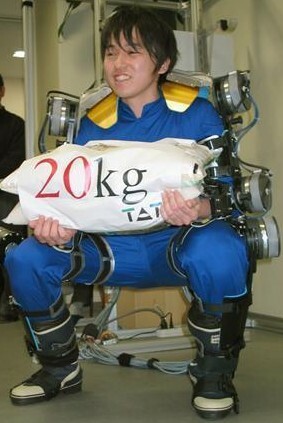 At the Tokyo University of Agriculture and Technology, a research team led by professor Shigeki Toyama has developed a wearable power-assist robot suit designed to boost the strength of farmers working in the field. At my writer’s group this evening, we got to talking about the [Amazon Kindle][kindle], the e-book reader that uses a very-low-power, [paper-like screen][eink] to let people read books and newspapers, and have content pushed wirelessly. I mentioned that I thought that paper books were on their way out, and some people disagreed; I’m going to explain why we won’t see bookshops on the high street in 2028. We all know, I think, of the huge shifts in the music industry. [CD sales are falling][cdsales]; figures from earlier this year had US CD sales dropping 20%. HMV have taken a [three-year, 60% stock price plunge][hmv]. Chains like MVC and Tower Records are dead. Virgin Megastores are [gone from the high street][vm]. Two things have conspired to kill the CD, and the stores that sell them. Neither of these things would have been enough on their own, but paired together, they have sealed the fate of the CD. It may look alive still, but it is fatally wounded. The two things, then; the [iPod], and broadband. First, the [iPod]. Portable music used to mean a walkman. You carried round one hour of music, and left your CD library at home. The iPod changed that, though. A full-fat 160gb ipod will hold about 3,000 albums. You don’t carry one item from the library anymore; you carry the entire library. This is huge. Once you’ve experienced it, the idea of not having all your music with you feels prehistoric. 1. Buy a CD and rip it. 2. Borrow a friend’s CD and rip it. 3. Download it from an on-line retailer line like [emusic] or [itunes][iPod]. 4. Download it from a site like [mininova] using peer-to-peer software like [µTorrent](http://www.utorrent.com/). Downloading is, again, simply better. Legit copies are cheaper, and the selection can be better than a shop. You don’t have to buy full albums, saving you more money. It’s fast, too. If you were standing in HMV’s doorway, and I was sitting in front of my PC, I bet you I could buy an album faster than you. And of course, using peer-to-peer software like [µTorrent](http://www.utorrent.com/), one could probably download it in about ten minutes, for free. The combination is lethal; the CD is no longer the component part of a music library; the MP3 has displaced it. What would it take for this to happen to books? Well, there would have to be a reading device that was comparable to reading a book. The [kindle] is one of the first devices, the [sony reader] is another. It won’t be long before we see a reader with a screen that compares to paper, but which will hold your entire library. And no reason why you couldn’t make readers share documents via bluetooth or wireless. We’ll have the book equivalent of iPods. Give that a couple of years. Then we’ll need book content, delivered over the internet. Well, that won’t be hard. The beating heart of the web is just that; a text delivery system. HTML and PDFs will be the new component part of a text library. Amazon will push publishers to produce electronic equivalents of their books, which won’t be hard because they are all typeset on computers anyway. Content will drive uptake of the readers; people with readers will demand content. The internet will deliver legitimate and illegitimate content, and readers will become standard urban gear. Borders will go the way of HMV. You know what I think the killer app will be here? Schoolkids. Schoolkids with one reader in their bag, with all their schoolbooks downloaded, along with a copy of wikipedia P2P-copied there just in case. Windows Vista. Just too much hassle. So, I’m just about to wipe my machine and move from Windows Vista back to Windows XP. I actually like vista for some things, but it’s basically just too much work and not enough payout. – it’s helpful if things go wrong, diagnosing problems and such more easily. On the downside, the security settings are just too much hassle; UAC, the control system which is supposed to limit the ability of malware to affect your machine, also stops you from doing any useful work. it’s infuriating. It also seems ‘slapped on’, just making life more difficult. It was difficult enough that I decided to install [ubuntu](http://www.ubuntu.com), a friendly form of linux, just to browse the web and try things out. If I wasn’t a windows programmer by trade, I’d probably be using that full-time. The middle of a pantomine horse. In many ways, programming is like a pantomime horse. Most programming tasks deal with one of two halves. There is the front end, which is the colourful world of web pages and clicky buttons and scrollbars and windows on your screen. The world of the pixel. Then there is the back end, the world of reading and writing data to disk. The world of the byte. Both of these are necessary and noble worlds, and a programmer will tend to either live entirely in one world, or straddle both. If you change jobs, you can go to your next career saying, ‘I’ve played the back end of a horse for many years now.’ and they’ll be able to partner you up with a front end, and off you’ll trot and go do productive work together. There is another path. A darker path. A path I have wandered down. The path of middleware. In this world, you don’t play with pixels, and you don’t play with data. Not the way others do. What you become is a conduit, a transit system transforming one thing into another. Like intestines. It is dark, and smells. It’s necessary, but it ain’t nice. I’ve been doing stuff like this for a while now, and I’m coming to the conclusion that it’s no fun being the middle of a horse. So I’m trying to retrain myself in the skills at the ends of the horse; I shall be (re)learning the arts of the database. The back end. After that, I’ll be learning new ways to write websites; the front end. Then I can be a whole horse again.